Are you buying a preexisting home with the intention of renovating it? 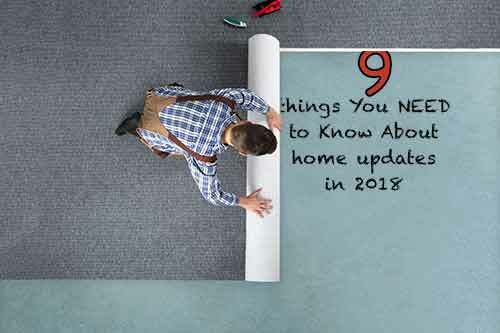 Here's a comprehensive list of the home updates worth your time, money, and energy. Is your home in need of a facelift? Whether you're looking to sell or you just want a chance, a little renovation can make your home feel good as new. Some renovating comes with a steep price tag, though. Others take a ton of time and effort. So how do you know if it's all worth it? Luckily, home updates don't have to break the bank or take up all your time. Keep reading for nine home updates that are worth your time, money, and energy. The carpets in your home really set the mood. If your carpet is worn, torn, or stained, it will make the entire room look worn out. New carpets, on the other hand, send the message that your home is clean, comfy, and welcoming. Though carpet can be pricey, it's worth the funds to get it updated. You'll love the new look and new feel of your home. And, if you ever plan to sell, new carpets will be better received than old, worn ones. If this is on your list, remember our team offers our wholesale pricing to our clients. Just ask for more details. A major bathroom remodel can set you back quite a bit, but a minor one doesn't have to. Making some small upgrades in your bathroom can really give it a major facelift. Don't worry about replacing the toilet or tub, unless they aren't looking or working great. Instead, focus on lower-cost fixes. A new vanity or mirror, and change in light fixtures, or a new coat of paint can change the entire look and feel of your bathroom. For a super simple bathroom change, replace old wall hangings with new ones and purchase new, matching towels. While focusing on the bathroom, pay attention to routine maintenance issues that may pop up on home inspections. Does the shower, sink, faucets or toilet need fresh caulk? If so, remember buyers use issues like these to judge the sellers over all maintenance habits, and its a good idea to address caulking before a buyers home inspector does! If you've got the funds, completely overhauling your kitchen cabinets is a big way to improve the value and style of your home. That can cost a pretty penny though. If you're looking for a lower-cost kitchen upgrade, simply replace the doors to all your cabinets and drawers. By only replacing the visible parts of your kitchen storage, you'll save a lot of money. This can be done with the help of a professional, or it can be a DIY project. For an even simple solution, just paint the cabinets and draws instead of changing the outsides. Looking for a cheaper option? Consider replacing the hardware (drawer pulls and door knowbs). This is a great time for an intensive deep clean before replacing the hardware. Is your water heater more than 12 years old? If so, you should consider replacing it. If you aren't sure, check for a manufacture date, which may be contained in the serial number. Updating after 10 years is a good idea, even if you aren't seeing issues. If you're having leaks or fails, you should get your water heater checked or replaced. One of the best home updates you can make isn't actually inside your home. Landscaping updates really change the look of your property, and it can be done for as much or as little money as you want. Add some interest by putting down some pavers. Or spruce up those front flower beds by changing the plants, topping off with fresh mulch, adding some bushes, or using a new material to create a border. If your lawn is looking shabby, that's a great place to start. Dead spots won't attract friends, family, or future buyers, and they're not fun to hang out on, either. Replace dead or weedy lawns with high-quality sod for a much better feel and look. Know that in Orlando, the best sod farms may take a few weeks for delivery, so plan accordingly. Your rain gutters do more than just catch rain and leaves. They redirect water away from your home's foundation, helping to prevent many different problems. Inspect your gutters and replace them if necessary. New gutters will protect your home better and they'll look great as well. If you're looking to give your home a facelift, try installing a different style, type, or color of rain gutter. If your gutters don't need to be replaced, repair any issues that need attention and make sure they're cleaned out so they can work effectively. Your kitchen is likely the focal point of your home. That means the flooring in there may be pretty worn out. If your kitchen floor shows scrapes, worn spots, or other signs of wear, it's time for an upgrade. You can't go wrong when spending the time, effort, and money on a new kitchen floor. It adds great resell value to your home, and your entire kitchen will look better than before. Kitchen flooring can range from affordable to luxury. Research your options and go with what's best for you. Light fixtures only last so long, especially those with ceiling fans. If those fans are used regularly, they'll get worn out at some point. Instead of waiting until that point, replace them to keep everything working well. The light fixtures themselves may be worn out too. If your light bulbs burn out more quickly, or you just want a new look, an update is a good, quick fix. Light fixtures can be an inexpensive way to update your whole home. Go for fancy, or more subdued. Either way, the update will feel and look good. How's the outside of your home looking lately? Siding may be worn, or paint may be pealing. Even if your home's exterior hasn't reached that point, an upgrade may be in order. New siding, updated paint, or something entirely new will make a huge difference in the appearance of your home. If you're looking to sell your home, this is a great way to draw potential buyers. Beyond the outer surface of your home, consider adding or changing railings, or building a nice big front porch. A few simple home updates can really go a long way. Whether you add new flooring or just add a fresh coat of paint, your home can feel like new. Give your home a breath of fresh air by making one, or more than one, of these home updates. Have fun, get creative, and see how much better your home can look and feel. Are you looking to sell your home? Check out our home marketing tips.